Greater Noida, March 15: Ridhima Dilawari became the first multiple winner of 2019 as she completed a start-to-finish win in the sixth leg of the Hero Women’s Pro Golf Tour at the Jaypee Greens in Greater Noida on Friday. The 20-year-old Ridhima, who has been in great form, shot a third successive under par round of three-under 69 to get to 10-under 206. Greater Noida, March 14: Ridhima Dilawari shot a second successive under-par round to ensure a four-shot lead at the end of the second round of the sixth leg of the Hero Women’s Pro Golf Tour at the Jaypee Greens in Greater Noida on Thursday. Ridhima, who already has one win to her name this season, carded one-under 71 to get to seven-under 137, the lowest two-round aggregate this season. Greater Noida, March 13: Ridhima Dilawari had an extremely eventful back nine that included an eagle, three birdies and three bogeys between the 11th and 17th holes as she carded a superb six-under 66 in the first round of the sixth leg of the Hero Women’s Pro Golf Tour, which commenced on Wednesday at the Jaypee Greens in Greater Noida. Greater Noida, March 12: Gaurika Bishnoi, who won her first title of the 2019 season last week, will start as one of the strong favourites when the sixth leg of the Hero Women’s Pro Golf Tour tees off on Wednesday at the Jaypee Greens in Greater Noida. 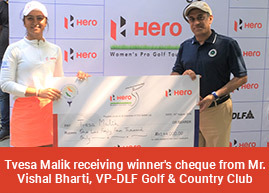 The sixth leg will carry a purse of Rs.Eight lakhs and has 21 professionals and four amateurs..
Gurugram, March 8: Gaurika Bishnoi held her nerve in the closing stages of the final round of the fifth leg of the Hero Women’s Pro Golf Tour event to become the fifth different winner this season. Gaurika, who led by four shots after the second round, completed a start-to-finish win with a final round of 71 even as Neha Tripathi made a late charge with an impressive four-under 68 to come within a shot of the winner. Gurugram, March 7: Gaurika Bishnoi took a stranglehold on proceedings at the picturesque Classic Golf & Country Club, as she moved four shots clear at the top after the second round of the fifth leg of the Hero Women’s Pro Golf Tour. Capetown, South Africa, March 16 : Diksha Dagar scripted history after a magnificent bogey-free final round of three-under to score a one-shot win at the Two million Rand (approx. US $ 140,000) Investec Women’s South African Open on Saturday. Queanbeyan, Australia, March 10 : Diksha Dagar wrote a new chapter in her young career with her maiden Top-5 finish at the New South Wales Open on Sunday. Left-hander Dagar, who won a pro event, while being an amateur last year, tured pro at the start of this and has been showing fine progress. Queanbeyan, NSW, Australia, March 8: Diksha Dagar continued to grow in strenghth as the young left-handed rookie shot a four-under 67 to leap to the Tied-12th place, up 21 places from T-33rd after her first round of 72. Canberra, February 28: Diksha Dagar, who gave herself a credible start as a pro on the Australian Ladies PGA Tour, will be back in action this week at the ActewAGL Canberra Classic. Along with Diksha, there will be four other Indian girls, Vani Kapoor, Astha Madan, Amandeep Drall and Tvesa Malik. Coffs Harbour, New South Wales, February 22: DIksha Dagar and Tvesa Malik braved the strong wind and rain to be the only two of the five Indian starters to make the cut at the Pacific Bay Resort Australian Ladies Classic – Bonville. Diksha (71-77) and Tvesa (75-74) are playing their first season in Australia. Ballarat, Feb 7: Vani Kapoor started with a solid two-under 71 on her LPGA debut at the ISPS Handa Vic Open, which is co-sanctioned by Australian LPGA and US LPGA. Ballarat, Australia, Feb 1: Vani Kapoor became the first Indian to earn a card for the Australian Ladies PGA Tour (ALPG) after coming through their first-ever Qualifying Tournament at the Ballarat Golf Club.